Home / Club or Bar / 11.17.18 – Dessert Auction, AIDs Flag Raising and coolest Karaoke in Worcester! 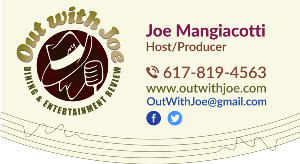 Good morning.. and welcome to this week’s out with Joe.. I’m Joe mangiacotti.. The Chiltern Mountain Club Annual Meeting will be held tomorrow from 12 to 3:30 pm Mosaic Common House, 22 Village Lane, Berlin MA ..
Tone-deaf Tuesdays at Electric Haze, 26 Millbury Street, Worcester… Every Tuesday Poison ‘N Envy hosts Worcester’s wildest karaoke night at Electric Haze. 6PM-2AM No Cover 21+ ID Required Games, Cash prizes, and more! Come get weird Worcester! You want to know what is hot and happening on the local music scene with Music Editor Tina Marie Billing and to learn more on these and other activities, Hidden Gems and Fantastic Finds.. check out outwithjoe.com and follow us on social media at out with Joe.